Maximizer rubber tracks are cost-effective alternatives to Next Generation rubber tracks. Although cheaper than Next Generation rubber tracks, quality is not compromised as they still work great in demanding environments. If you are working with a limited budget, these are the tracks for you. McLaren uses only advanced rubber compounds when constructing Maximizer rubber tracks. These special rubber compounds give the tracks strength and durability. Wear is minimized and track life increases due to the tough rubber used. Maximizer tracks are made with 30% more rubber than similar aftermarket tracks. The extra layers of rubber make these tracks exceptionally durable and reliable. When compared to similar aftermarket rubber tracks, they have a significantly longer track life. The Maximizer rubber track is reinforced by a single steel belt which enhances the tensile strength and durability of the track. The probability of track breakage is significantly minimized as the steel belt is continuous and does not overlap. Compare this to other rubber track manufacturers that use an overlapping, cast iron belt as reinforcement. Although cheaper, these cast iron rubber tracks compromise on quality and are prone to breakage. A Maximizer rubber track is strengthened by the embedded continuous steel belt, made from heat-treated, forged steel for outstanding durability. This continuous steel belt maximizes tensile strength and translates to a longer track service life. As previously mentioned, McLaren created their line of Maximizer rubber tracks for those contractors working with a restrictive budget. However, though they are cheaper than Next Generation rubber tracks, this is not to say that they are of low quality. The opposite is actually true – Maximizer rubber tracks are high-performing, durable and extremely reliable. The rubber compounds used in constructing these tracks are high-quality compounds and are also cost-effective, especially when compared with other rubber tracks made by other manufacturers in a similar class. Track integrity is optimized by the continuous steel links embedded in the tracks which make these tracks a great, cheaper alternative to Next Generation Rubber Tracks. Maximizer tracks are a great solution for small scale contractors working within a budget. Compared with other aftermarket tracks within the same price range, they are the most cost-effective track system on the market. McLaren offers Maximizer rubber tracks in width sizes ranging from 180mm to 230mm. At Monster Tires, we stock both Next Generation and Maximizer rubber tracks for aerial platforms at great prices. These tracks are compatible with a wide range of aerial work platforms available on the market. We highly recommend these premium tracks for your aerial platform operations as we guarantee an improvement in productivity, efficiency and safety on job sites. Give us a call today for a quote! 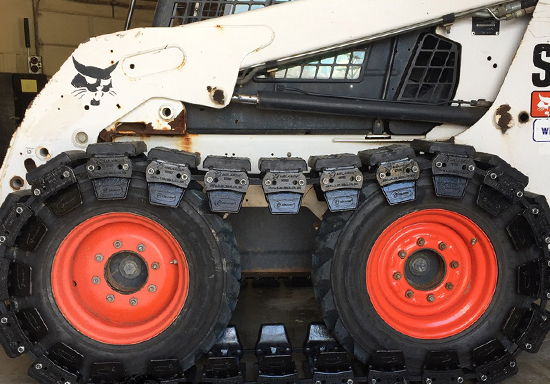 McLaren’s line of rubber tracks for dumpers are compatible with a wide array of dumpers available today, manufactured by trusted names like Canycom, Komatsu, Morooka, Hinowa, Yanmar and Kubota. Monster Tires offers all sizes of both Next Generation and Maximizer rubber tracks at convenient prices. For more information and to get a quote, give us a call today! This entry was posted in Over The Tire Tracks, Rubber Tracks, Skid Steer Tracks. Bookmark the permalink.